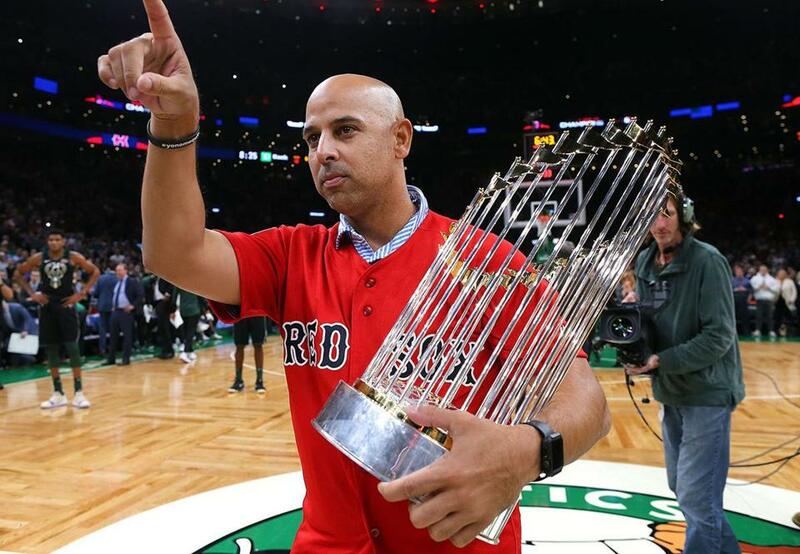 Alex Cora sensed it before anyone else did, from what he’d seen of his players in spring training and during their first series at Fenway Park. “You had a feeling that the city was going to fall in love with them,” the rookie manager mused. It wasn’t just that the Red Sox won a franchise-record 108 games, then dismissed the Yankees, Astros, and Dodgers en route to their fourth World Series crown in 15 years. It was the endearing way that a once-underachieving group did it — selflessly, humbly, playfully, and unremittingly. After consecutive early exits by divisional winners got skipper John Farrell dismissed last year, expectations were considerable for the most expensive roster ($228 million) in the game. Yet while the initial lineup was nearly the same one that finished the previous season (with the muscular exception of designated hitter J.D. Martinez), the all-in attitude was a notable change. That was the essential objective for Cora, who’d played in Boston for four seasons and earned a ring with the 2007 club as a reserve infielder. Though he’d never managed in the majors (he was bench coach of last year’s Houston champions), he had the qualities that the front office wanted. A respect for analytics, a natural rapport with Latin players, a knack for communicating, and an unflappable demeanor suited to a demanding and jittery fandom. Cora immediately set about creating a chemistry with and among his charges, traveling to visit them during the winter and arranging for a dinner for the entire traveling party just before the season opened during which players spoke candidly about their experiences. The manager wanted to see the bonding produce dividends on the diamond, which is why claiming the Grapefruit League title in spring training (which Boston did by winning 14 of its final 15 games) was an encouraging milestone. The club’s indefatigable character became evident in a span of five games during the initial homestand in April. The Sox came from two runs down in the ninth inning of their opener to beat Tampa Bay on a walkoff single in the 12th and rallied from five runs in arrears in the eighth to win, 8-7, three days later. Then, after demolishing the Yankees, 14-1, with a nine-run sixth capped by Mookie Betts’s grand slam, the Sox rallied around pitcher Joe Kelly amid a bench-clearing brawl in a losing cause the next day. 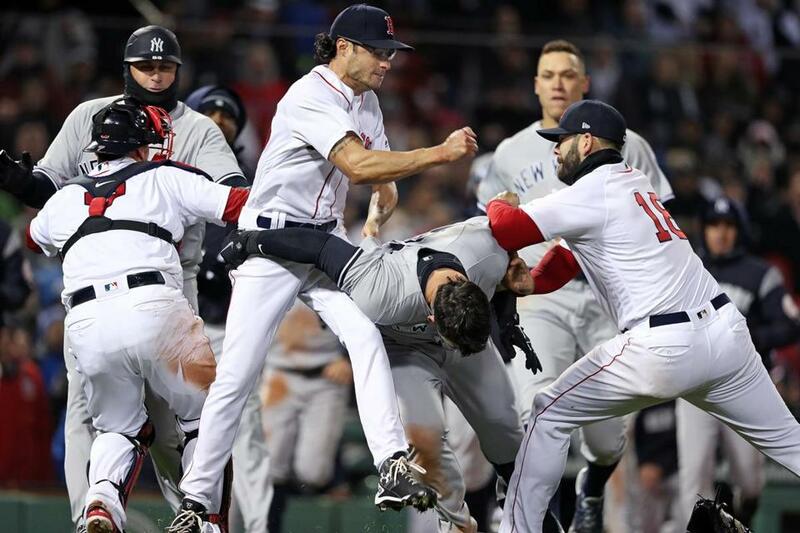 Joe Kelly was in the middle of the April brawl against the Yankees. Coincidentally or not, the Sox won their next eight games to run their record to 17-2, the best start in franchise history. As dominant as the Sox were throughout the spring, they still were very much in a divisional race. At the beginning of July, they were tied with New York for the lead after an 11-1 loss in the Bronx. But when they pulled away that month with a 10-game winning streak, it was definitive. A four-game home sweep of the Yankees at the start of August, climaxing in a 10th-inning walkoff victory after trailing by three runs in the ninth, was a percussive punctuation. When the club sagged late in the month, dropping six of eight, Cora remained sanguine, adhering to his turn-the-page mantra. 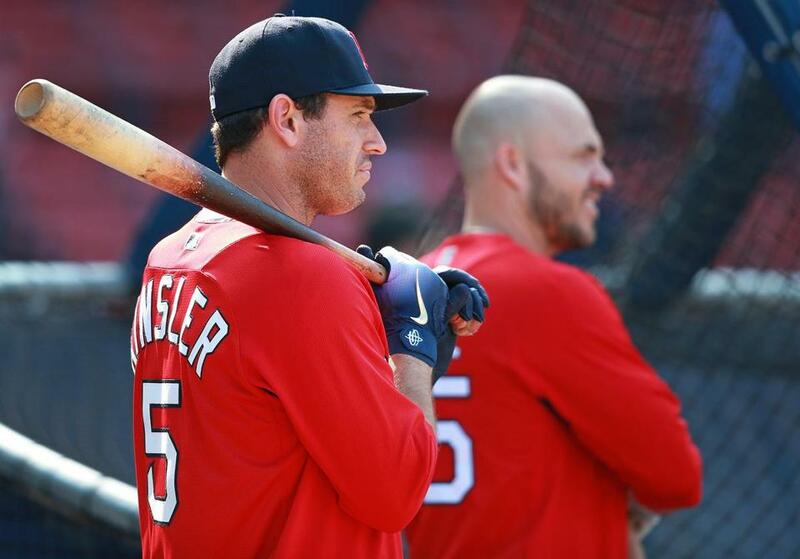 Ian Kinsler and Steve Pearce, pictured looking on during a July 31 batting practice, joined the Sox at the trade deadline. The club clearly had the goods to contend in October, which is why baseball operations president Dave Dombrowski was content merely to add complementary pieces before the trading deadline, picking up pitcher Nathan Eovaldi, first baseman Steve Pearce, and second baseman Ian Kinsler for a quartet of minor leaguers. Still, as autumn approached, skeptics were unconvinced that the Sox had championship mettle. They’d feasted on cellar-dwellers, winning 31 games against last-place rivals while posting a losing record against the other American League playoff teams. None of their top pitchers, most notably Price, had ever won a postseason game as a starter. And despite coming in as AL East victors, the Sox had been wiped out by the Indians and Astros the previous two seasons. The worriers appeared justified after Boston had to sweat out a 5-4 victory over New York in the Division Series opener at Fenway after going up, 5-0, in the third inning, then took a 6-2 drubbing the following night when Price was yanked in the second. “A lot of people gave up on us after losing Game 2,” Cora remarked. 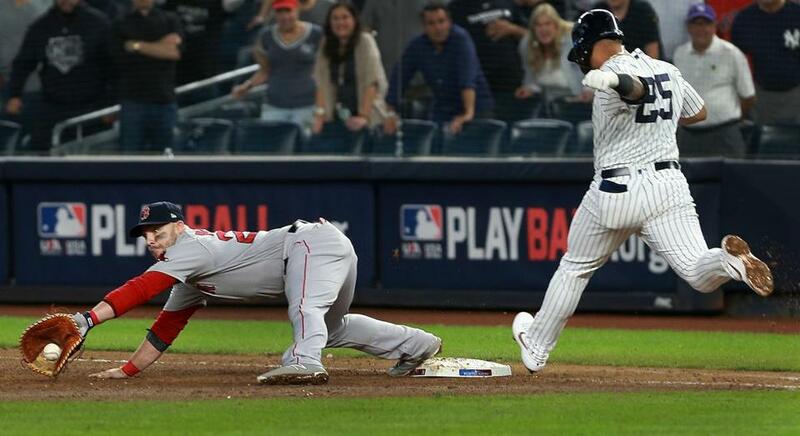 What followed was one of the most startling reversals in playoff history as Boston bashed the Yankees, 16-1, at the Stadium, putting up seven runs in the fourth, as Brock Holt hit for the cycle for the first time in postseason annals. The next evening’s 4-3 clincher literally came down to a photo finish as the Sox had to put their on-field celebration on pause until the video replay confirmed that Eduardo Nunez’s throw from third had nipped Gleyber Torres at first. Steve Pearce made a win-sealing play, stretching to make the catch and hold the bag for the final out in Game 4 against the Yankees. Beating the Astros, who’d won 103 games and swept Cleveland in their Division Series, was a taller order, especially after Houston rocked Boston, 7-2, in the Fenway opener. But the matchup began turning in Game 2 when Jackie Bradley Jr.’s bases-clearing double erased a two-run deficit in the third. The eventual 7-5 triumph set up an emphatic three-game wipeout in Texas. The Astros had won eight of nine games at Minute Maid Park during their 2017 title run, handing Boston successive 8-2 poundings in the ALDS. This time the Sox did the damage, with Pearce’s solo homer giving them the lead in Game 3 and Bradley’s slam off Roberto Osuna capping a five-run eighth and their own 8-2 statement. “We never feel like enough runs is going to be enough,” said Bradley, who went on to be named MVP of the ALCS. So the Sox produced eight more in Game 4 the following night, with Bradley’s two-run homer in the sixth inning putting them ahead for keeps. But the Astros, deprived of Jose Altuve’s apparent two-run homer by fan interference in the first, had the winning run on first in the ninth after three walks by closer Craig Kimbrel. It took a headlong diving catch by left fielder Andrew Benintendi on Alex Bregman’s liner to save an 8-6 triumph after a league-record four hours and 33 minutes. That set the stage for the clincher, with Price on the mound against Astros ace Justin Verlander. Price didn’t need to be reminded of his October shortfalls. 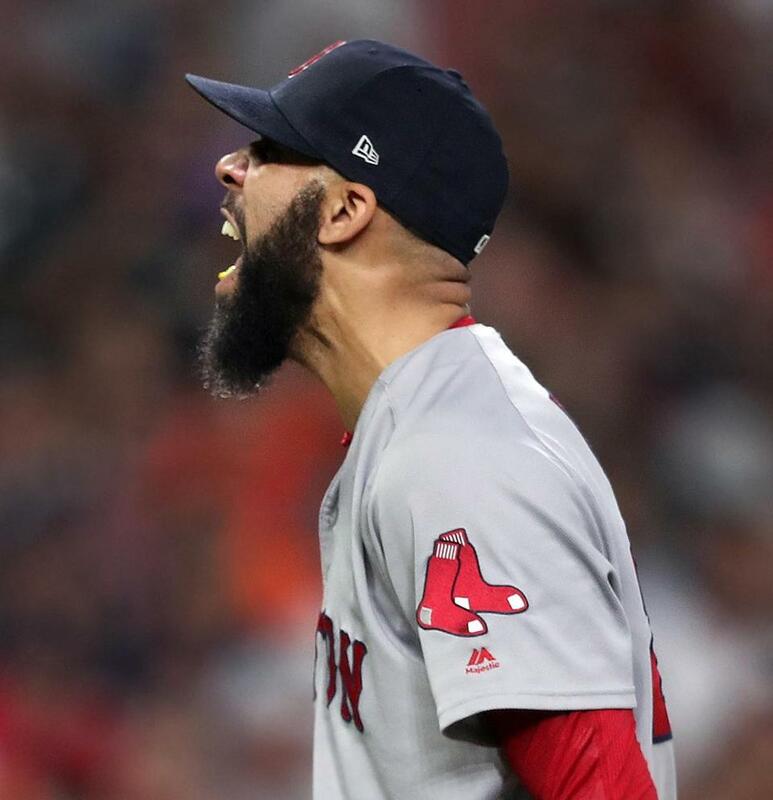 So he wrote a bold-face revision, submitting six scoreless innings with nine strikeouts as his mates parlayed a homer by Martinez and a three-run shot by Rafael Devers into a 4-1 triumph that assured Boston’s first pennant in five years. David Price allowed three hits and struck out nine without a walk in Game 5 of the ALCS against the Astros. The Sox simply kept coming at opponents, inning after inning. “What we bring every night is the unsexy stuff that’s not talked about,” said Pearce, a 35-year-old journeyman who’d played for every club in the division but blossomed in Boston and became World Series MVP. Cora, who knew that he’d be in a mix-and-match game with Dodgers counterpart Dave Roberts in the World Series, had a masterful touch with his lineups, switching and subbing with aplomb. “He’s one of the best I’ve ever seen at being able to just know what’s going to happen,” said first baseman Mitch Moreland. When Cora plugged in Nunez for Devers with two out in the seventh inning of the opener at Fenway, the pinch hitter responded with a three-run homer that turned a one-run game into an 8-4 blowout. 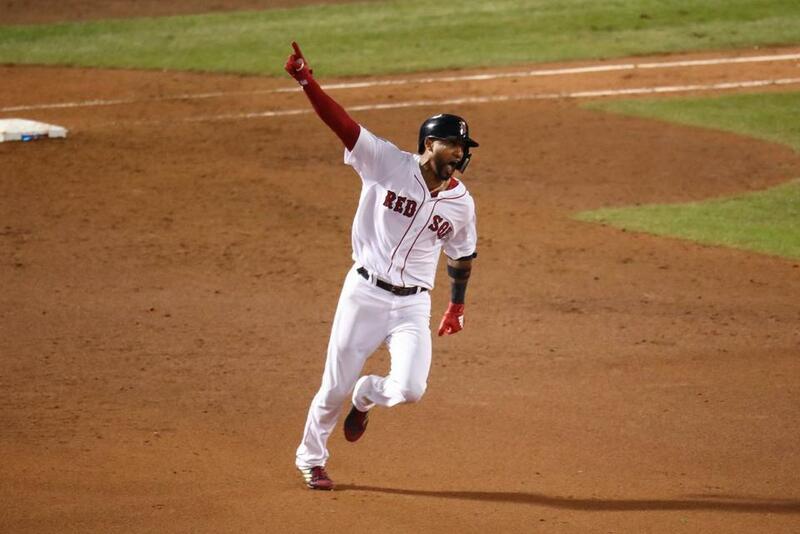 Eduardo Nunez’s three-run shot sealed the Red Sox’ Game 1 victory. As it had on the opening evening of the Series, a rainbow before Game 2 presaged good fortune for the Sox, who rallied from a run down in the fifth with one of their trademark two-out eruptions, producing three runs on three singles and two walks. Price and relievers Kelly, Eovaldi, and Kimbrel retired the final 16 Dodger batters for a 4-2 triumph, helped by a balletic leaping catch near the left-field scoreboard by Benintendi that evoked Baryshnikov. “I honestly thought when I jumped that I was going to hit the wall,” said Air Benny. After Bradley’s two-out homer in the eighth tied Game 3 and a parade of relievers kept Los Angeles at bay, the Sox were on the verge of pushing the Dodgers to the precipice when a Nunez single put them ahead in the 13th. But Kinsler’s throwaway on a grounder let the hosts draw even, and with his bullpen depleted, Cora had to bring in Eovaldi, his planned Game 4 starter. What ideally would have been one inning’s work turned into more than six as Eovaldi threw 97 pitches. 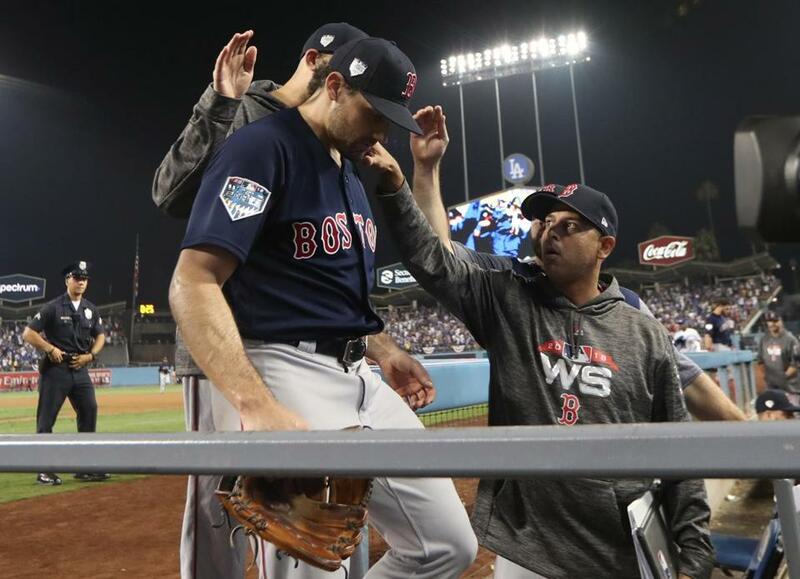 Alex Cora comforted Nathan Eovaldi after Max Muncy’s game-winning home run. “I’m good, I’m good,” he assured Cora after each inning. When Max Muncy’s homer had ended things in the 18th after seven hours and 20 minutes, Eovaldi’s teammates gave him a standing ovation in the clubhouse. “That was nothing short of incredible,” Sale declared. Instead of being deflated by the 3-2 loss, the Sox were encouraged. It had taken their rivals the equivalent of two games to win one. For most of Game 4, it appeared that one of their alumni, Milton lefthander Rich Hill, would do in the Sox with his mystifying curve. But after Roberts lifted him in the seventh, the Sox feasted on half a dozen relievers as Moreland clubbed a two-out, pinch-hit three-run homer, Pearce followed with a solo shot in the eighth, and Boston added five more in the ninth for a 9-6 decision. 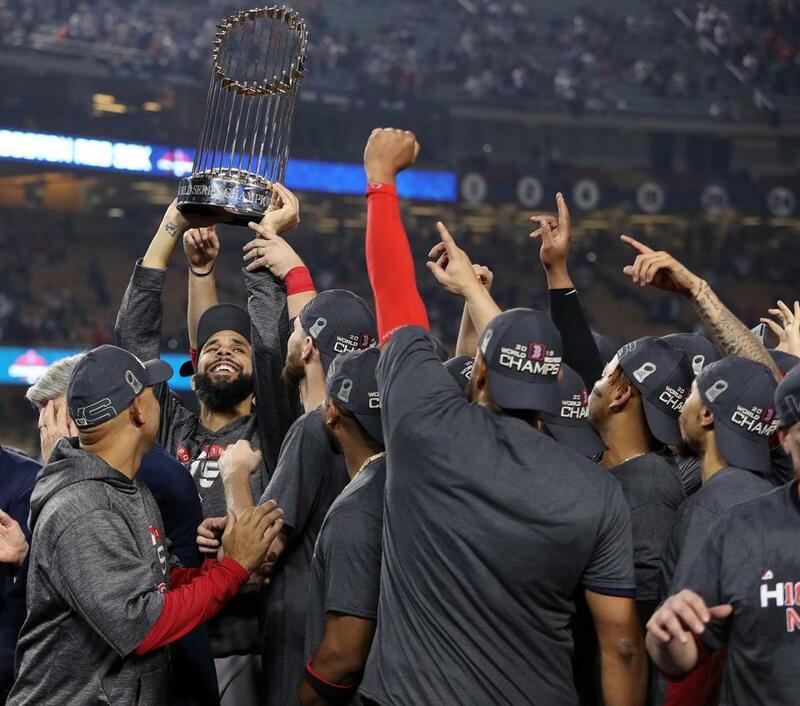 David Price was surrounded by his teammates as he hoisted the trophy after winning the World Series. That set the stage for the closeout and the ultimate redemptive moment for Price, who outdueled LA ace Clayton Kershaw with six scoreless innings after a leadoff homer, while Pearce whacked two more homers, and Martinez and Betts also went deep. The most successful club ever to grace Fenway ended up as the best in baseball in a season where their manager and players expected nothing less.